I was invited to participate in another virtual book tour being hosted by TLC earlier this summer, and having had so much fun with the previous one, I was eager to take part. This book is very different from the novel that I reviewed last summer, but the topic is one that I have pondered on my own many times over the years, especially as our family grows more of our own food, with livestock becoming a part of that move towards self sufficiency. Herzog is certainly not a proponent of cockfighting, he even goes to the trouble to buy humanely raised meat and free range chicken for his family, but he does a good job of holding a mirror up to our society’s often distorted sense of morality. 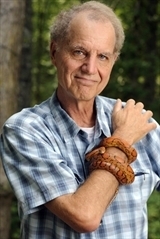 To his credit, he counts himself among the rest of us when pointing out the flaws in our collective thinking, acknowledging that “human attitudes toward other species are inevitably paradoxical and inconsistent“. He also speaks at length about vegetarianism and the attitudes behind it, as well as the phenomenon of ex-vegetarians (which outnumber their vegetarian counterparts 3 to 1 apparently, and of which I am one). It was a progression that I easily related to, and I thought he nailed the reasoning that leads to this lifestyle for many people. I was “reformed” from my vegetarianism when I realized that animals were going to die whether I ate them or not (I blame 70’s Disney movies for my warped relationship with animals), and in the wild it’s often a long, slow, painful death. If we give our meat animal of choice a humane life and a dignified death, that makes it okay to eat them, doesn’t it? (Who am I kidding? I’m as likely to eat my chickens as I am to eat my cat, dog or rabbit). 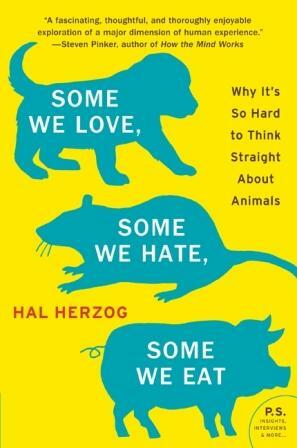 These kinds of convenient rationalizations are the crux of Herzog’s book, and while he doesn’t provide us with clear answers as to why our moral relationship with animals is so murky, he lets us off the hook by acknowledging that “these sorts of contradictions are not anomalies or hypocrisies. Rather, they are inevitable. And they show we are human“. I thoroughly enjoyed Some We Love, Some We Hate, Some We Eat. It’s funny and thought provoking, and I’ve found myself talking about it on several occasions over the past few weeks. I highly recommend it for anyone who lives with, despises, or eats animals. A great review; thank you! I think like a lot of issues today, people simple don't think. In this case they don't think about where their food comes from…. I'm glad you found this one both readable and thought-provoking.